Headed out of Albany for Eugene and the McKenzie Valley. There is a heat wave and it's 100 degrees. Feels okay. I'm drinking lots of water. On other trips, I'd beat the heat with fruit juice and soda pop, but finding out that my blood sugar is a bit high has convinced me to try and use the water bottle more. 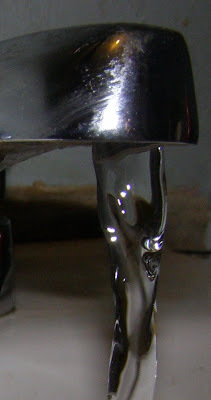 Tap water is often the best. Sometimes it is hard to find parks where one can fill the water bottle. There sure are a lot of stores selling pop and so forth. Tempting and some of the stores might not want you to go in just to fill a water bottle for free. I don't buy bottled water that is available from a tap for free. So I still buy something, snack food, peanuts, an apple, an occasional chocolate milk and I'm drinking more regular milk now; without the added sugar of the chocolate. Then I'm making sure I fill my water bottle at each stop. No one complains that I'm freeloading on their water faucet. One place I passed had Orange Juliouses. It was tempting so I ordered a small, then also filled my water bottle. 100 degree heat and I'm feeling fine. Consuming less sugar and I feel a lot cleaner on the inside.